← Poland: A country with almost no Jews! On Sunday, Muqtada al-Sadr, prominent Shi’ite cleric and former leader of Iraq’s military resistance against US Occupation Force led by disgraced Gen. David Petraeus – has called the expulsion of all American citizens from Iraq in retaliation to Donald Trump’s ban on Muslims from Iraq and six other Muslim countries. “It would be arrogance for you to enter freely Iraq and other countries while barring them the entrance to your country – and therefore you should get your nationals out,” Sadr said in a statement. On Monday, Iraqi government asked Washington to reconsider the travel ban on its citizens – taking a more diplomatic line than Iraqi parliament which demanded the government to retaliate against US soldiers and citizens. Muqtada al-Sadr is the most feared Iraqi leader by the Zionazi mafia. For example, anti-Muslim Israeli-pig, Daniel Pipes’ The Middle East Quarterly warned Washington in 2004: Muqtada al-Sadr is the greatest threat to Iraq’s stability. 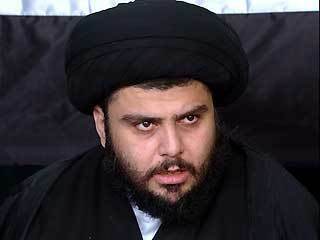 On May 16, 2008, Greg Bruno at Zionist think tank CFR described Muqtada al-Sadr,”He is a young, fiercely anti-American messianic cleric and the head of Mahdi Army, a militia that has fought against US forces and their allies“. YEP – an Army without F16s, tanks, helicopters and nuclear tip bullets. On April 24, 2016, Zach Abels at the Jewish The National Interest splashed the headline: Muqtada al-Sadr: From Rabid Warlord to Gandhi. On May 13, 2016, Jewish Al-Monitor called Muqdata al-Sadr, The Most Powerful man in Iraqi politics. On May 20, 2016, Michael Weiss called Muqtada al-Sad: Donald Trump of Iraq, at The Daily Beast. On July 18, 2016, Bill Riggio, the Zionist Jew managing director of the FDD’s Long War Journal shouted: US Troops are a target for us, says Iraq’s Muqtada al-Sadr. On October 19, 2016, Israel Lobby, WINEP, carried the headline: Beware of Muqtada al-Sadr. On January 24, 2017, Middle East Eye (Editor David Hearst) warned Trump and Netanyahu that if the US embassy is moved to Jerusalem, Mahdi Army would support Hizbullah and Hamas against the Zionist entity. On December 20, 2010, the Jewish Time magazine said that Muqtada al-Sadr is the most popular Iraqi nationalist leader who doesn’t take orders from Tehran. Muqtada al-Sadr follows his father Mohammed Sadiq al-Sadr’s (martyred by Saddam Hussein) nationalist and religious thinking. Sadiq was opposed to foreign interference in Iraq, whether it came from the US or Iran. He called for Sunni and Shia unity. He would often begin his sermons with the refrain: No, no to America; no, no, to Israel; no, no to the Devil. In December 2016, Iran’s Supreme Leader Ayatullah Ali Khamenei advised Iraqi religious leaders during a meeting in Tehran – never trust American leaders. Jewish-Zionist plans for war against Iraq had been in place for years. In mid-1996, a policy paper prepared for then-Israeli Prime Minister Benjamin Netanyahu outlined a grand strategy for Israel in the Middle East. Entitled “A Clean Break: A New Strategy for Securing the Realm,” it was written under the auspices of an Israeli think tank, the Institute for Advanced Strategic and Political Studies. Specifically, it called for an “effort that can focus on removing Saddam Hussein from power in Iraq, an important Israeli strategic objective in its own right. The authors of “A Clean Break” included Richard Perle, Douglas Feith, and David Wurmser, three influential Jews who later held high-level positions in the Bush administration, 2001-2004. The role played by Bush administration officials who are associated with two major pro-Zionist neoconservative research centers has come under scrutiny from The Nation, the influential public affairs weekly. The author, Jason Vest, examined the close links between the Jewish Institute for National Security Affairs (JINSA) and the Center for Security Policy (CSP), detailing the ties between these groups and various politicians, arms merchants, military men, wealthy pro-Israel American Jews, and Republican presidential administrations (here). This entry was posted in World News and tagged Iraq. Bookmark the permalink. There is a simple, exquisiteness in which Ali Khamenei directly shines light on the truth. Sadr, similarly has this discernment.